It has 26 pages including the covers and is in Excellent Condition. Sales Folder. This is an original Sales folder. 6 pages and loaded with full color Illustrations of all models. Dashboard, interiors, engine, features, specifications. A great piece. 9X12" as shown. New car sales literature for all models of 1983 Dodge Charger. Very good condition. This is an ORIGINAL brochure, NOT a reprint. Features of this brochure Highlights many of the great Dodge features found in these vehicles. SUPER CLEAN. Paul Politis. SERVING the COLLECTOR CAR HOBBY and MOTORING PUBLIC SINCE 1974. SRT SUPER BEE. This is an ORIGINAL brochure NOT a reprint. 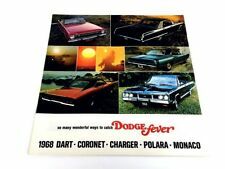 Features of this brochure Highlights many of the great Dodge features found in these vehicles. Dodge's ref # 74-383-2432 09/13. SUPER CLEAN. Nunc pellentesque blandit lectus, at semper massa sodales vel.Hyperlink. 357 Blue Bird Trail. Paul Politis. SERVING the COLLECTOR CAR HOBBY and MOTORING PUBLIC SINCE 1974. It has 42 pages including the covers and is in Excellent Condition. 66 67 68 69 70 71 - 440 6 426 HEMI. 4 CHRYSLER ART PRINTS. 4 ART PRINTS - MINT CONDITIONS. PRINTED ON HEAVY WEIGHT FINE QUALITY ART BOARD PAPERS. ALSO PROTECTED IN WATERPROOF DUPONT TYVEC PLASTIC. Color and upholstery -- examples of the paint and upholstery. However, they are often the only source for hard-to-find upholstery swatches - these are actual fabric samples and not printed images. Includes an illustration of each type of interior. Beautiful original Chrysler piece was part of the Historical Art Print series produced by Chrysler Marketing in the early 1990's, and distributed to dealers through the Mopar Parts Division. Each lithograph was created from original signed hand-painted airbrushed artwork, illustrated with gouache paint. It is an original piece from Dodge not a reprint and is in very good to excellent condition. No writing, corner folds or smudges. It was originally stapled as a centerfold. 11/15/18 - BOXES DODGE 2010. This is an original 11 page color article carefully removed from Collectible Automobile on the famous 1966 - 1967 Dodge Charger fastback! This article has nice glossy color pictures and interesting history of the development of the Charger. There are pictures of the famous Charger show cars of 1964 and the fastback of 1965, along with great pics of the interior, including those rear bucket seats. The prices and production for each year, prices and weight are all included. This is a rare find for the Dodge fan! The article is in excellent condition and will be carefully mailed with cardboard backing. Thanks for looking!. 2019 Dodge full line brochure. LOADED WITH INFO AND SPECIFICATIONS. This was a brochure produced by AUTOWEEK magazine for distribution at Dodge dealers. Here we have a2015 Dodge SRT sales brochure/magazine. This is an ORIGINAL brochure NOT a reprint. This brochure covers the following models. This is an ORIGINAL brochure NOT a reprint. Features of this brochure highlights a few of the great Dodge features found in these vehicles. Dodge's ref # 74-383-2544 05/05. interior, exterior color choices. This 1976 Dodge Sales Brochure is in good condition. Great color throughout. Buy One Receive Two. 1971 Dodge car and truck Dealer Data Book, Very nice, well above average condition. Brochures are placed between to rigid pieces of cardboard and placed in a Bubble Wrap Envelope. Here we have a1967 Dodge Full Line sales brochure. This is an original brochure NOT a reprint. Interior pages are. 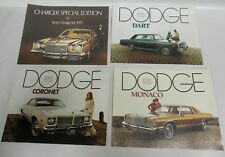 This brochure covers the following models Features of this brochure ----highlights a few of the great Dodge features found in these cars. Color chart and specifications. Very good condition. SERVING the COLLECTOR CAR HOBBY and MOTORING PUBLIC SINCE 1974. 357 Blue Bird Trail. Paul Politis. 1966 Dodge Color Upholstery Dealer Album Dart Coronet Charger Polara Etc. 1966 Dodge Polara. 1966 Dodge Coronet. 1966 Dodge Coronet 500. Color and upholstery -- examples of the paint and upholstery. However, they are often the only source for hard-to-find upholstery swatches - these are actual fabric samples and not printed images. 1986 Dodge Aries Coupe 2-Door. 1986 Dodge Aries LE Sedan 4-Door. 1986 Dodge Aries SE Coupe 2-Door. 1986 Dodge Aries SE Wagon 4-Door. 1986 Dodge Diplomat SE Sedan 4-Door. 1986 Dodge Conquest Hatchback 2-Door. We are a Family Owned/Operated automotive group with 30 years experience. SET OF TWO- ONE EACH FOR EACH YEAR.